Every aspect of my performance has been enhanced as a result of my degree. Jeff’s role is a varied one to say the least. “I deliver everything beyond the bricks and mortar,” he says. 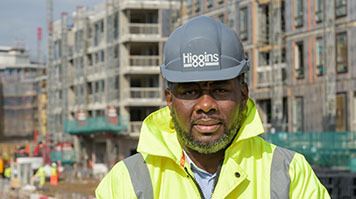 “I manage and deliver community programmes to make sure that the stakeholders on the redevelopments we work on become part of the process and don’t feel excluded from the works or the construction process. Thanks to his degree from LSBU, Jeff feels that his future is a positive one. “The world of community development is a great one to work in,” he says. “When I started out twenty years ago, it was unusual and disjointed. These days, it is more commonplace but remains a specialist field, and it’s a great one to be in. Although he may have been a latecomer to HE, Jeff’s parting comment suggests that he isn’t finished with his education just yet: “I’d still love to undertake a Master’s or a PhD,” he smiles.